Yammer would not be complete without a way to post relevant information. That’s what this business solution is all about: having access to important information at all times. You have several options for the type of content you choose to post. Update: This is the most general type of post. This can be anything you think might be of interest to those in your network. For example, you can post links to relevant content or simply an issue you had getting into the parking lot. 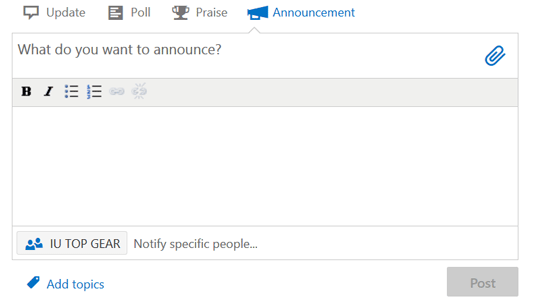 Poll: Formulated like a basic questionnaire, Yammer will prompt you to ask a question. Then it will provide spaces for you to input multiple-choice answers for others to choose from. You can also specify specific people you would like to notify of the poll: only those in a particular group or everyone in your network. There is also the option of tagging a topic and adding attachments. Praise: Who doesn’t like a pat on the back? Indicated by a green icon with a thumbs up, this post lets you identify someone you think deserves kudos for a job well done. Similar to the poll option, there are spaces that let you add attachments, tag topics, and choose whom you would like to notify. Announcement: When posting to a Group, you have one additional option. Announcement allows you to make Group-specific postings that are only relevant to those who are a part of that Group. This is a good place to post upcoming events or deadlines. Announcement lets you format text, add attachments, tag topics, and choose specific people to notify. Yammer is not Facebook. It is not the appropriate place to voice frustrations over bosses or derogatory comments of any kind. If you wouldn’t want your grandma to read it, don’t post it here.